A few years back he sent me an Oyen Digital MiniPro external USB 3 SSD which I use as a bootable Yosemite drive for emergencies. Just recently the Brown Truck arrived carrying a Transcend 128GB portable SSD that’s the size of a few credit cards stacked together, again with a USB 3 interface. I think this was in response to the tests I ran on the OWC Envoy Pro Mini SSD. We got into a great discussion on how to measure speeds on SSDs, how it matters greatly what kind of files you’re trying to move (compressible vs. incompressible) and whether the memory is synchronous or asynchronous flash. Like the OWC unit, the Transcend ESD400 promises 410MB/s reads, and writes of up to 380MB/s. It’s time to run some speed tests to verify these claims. As you may recall, the Blackmagic Speedtest is for real time video read/writes but let’s see what it says anyway. Blackmagic shows 140MB/s writes, but 418MB/s reads. Read is right in line with what they promised but the write speed isn’t nearly what they show on the box. Maybe it’s the wrong kind of test, as we learned during the last speed tests. 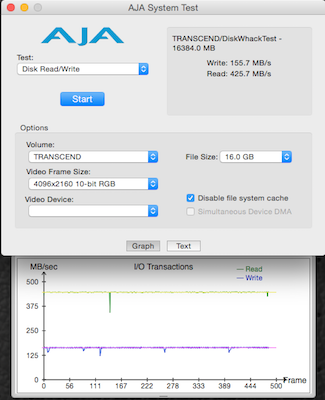 The fine folks over at OWC suggested a speed test for more real world testing is one called AJA System Test from AJA Video Systems available for free for Mac and Windows. Surprisingly with AJA I got lower speeds. I ran a 128MB test and a 1GB test and I got around 80MB/s write and up to 390MB/s reads. That’s even worse than the Blackmagic test. I noticed that the drive was formatted MS-DOS FAT-32 so I thought it might be interesting to test the drive in the native Mac format Mac OS Extended (which I believe is HFS+). After I reformatted, the AJA test for writes almost doubled as it went to 150MB/s write, while holding strong at around 385MB/s reads. I should mention that the AJA test is also looking at video speeds so there’s a pulldown for choosing the video frame size along with the file size you want to test. I looked back at the post I did explaining Synchronous vs. Asynchronous flash memory and changed the settings to match those I did with the OWC Envoy Pro Mini. In those tests I used a 16GB size file and chose the largest video frame size of 4096×2160. It really pays to write a blog about everyone you do and document with screenshots so you don’t have to rely on your own memory! The Transcend SSD got a slight bump up with this test, sticking at 155MB/s write speed and went went up to 425MB/s read. I still wasn’t even seeing half of the read speeds they promised though. 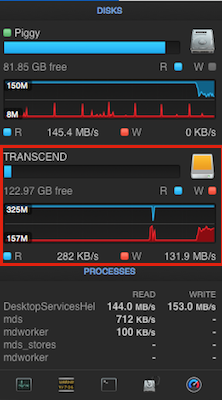 Perhaps I should do a true real world test, drag a truckload of files over to it and see how it does using iStat Menus from Bjango. I grabbed the last five years worth of NosillaCast folders (without the audio files) which was over 2000 files totaling 10GB and simply dragged it onto the Transcend SSD. I grabbed a screenshot when it was at its highest rate which showed 132MB/sec write speed. That lines up pretty well with the official tests so I think we’ve got some good metrics. In all of my tests it performed writes at less than half of the rated speeds. That’s not good but I’d like to point out something. The 10GB transfer of 2000 files took a grand total of 1 min and 15 seconds. So I could have cut that 105 seconds down to say 40 seconds. If you’re scheduling your life that tight, you might just want to think about loosening up your schedule! The Transcend ESD400 Portable SSD is vert small but still bigger than the Envoy Pro Mini, the Transcend performed writes at less than half the rated speeds but performed just as well on reads. The big difference is the price. The 120 GB Envoy Pro Mini will run you $120 at OWC while the Transcend ESD400 is only $83 on Amazon right now. I think the sizes have gotten small enough that the Transcend might win my vote since I’d mostly be writing to it on travel and it’s 30% less expensive. I like that we have so many awesome choices in this arena now, you pretty much can’t go wrong. 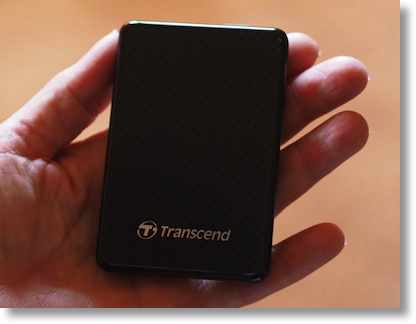 I should also mention that the Transcend comes all the way up to a terabyte – which will run you $450. Pretty cool to have a TB in your pocket! I’m not sure why, but I’ve often read that Mac throughput in “speed tests” will be slower than Windows. Guess: the HFS+ “Journaling” adds overhead? Then there’s those hidden files that are part of OS X folders. View hidden files, and you’ll see the extra. And, while Internationally Famous Podcasters have the responsibility to test gear for the benefit of their public, running speedtests on SSDs is not good for them. So if you’re not running a speedtest as Allison is doing fou “the greater good,” don’t run one at all.